Ledbury, UK — Babcock’s FORECAST has reached Stage 2 of the Carbon Trust’s Offshore Wind Accelerator (OWA) road map for commercial acceptance of floating LiDAR, having consistently exceeded the required KPI’s for accuracy and availability as verified by the Carbon Trust and DNV-GL. Stage 2 permits that, following this successful pilot validation trial, the floating Babcock FORECAST ZephIR LIDAR technology may be utilised commercially. Babcock’s business development manager, Chris McConville said, “We are delighted to have our approach to floating LiDAR, based on ZephIR 300, validated by the Carbon Trust and OWA partners in the most comprehensive validation conducted to date. 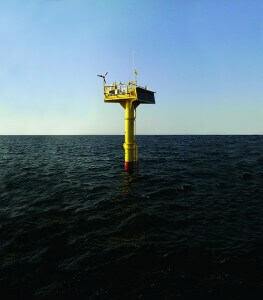 FORECAST is based around Babcock’s own low motion buoy, designed specifically to address the known adverse effects of motion on data accuracy. This high stability platform replicates the conditions of a fixed mast as closely as possible. Babcock selected the industry leading ZephIR 300 wind LiDAR due to its proven accuracy and reliability. Hosting it on a stable platform, combined with ZephIR 300’s unique Continuous Wave laser technology which delivers unparalleled 50Hz wind data, completely removes the need for any mechanical motion compensation or post processing algorithms for data correction. This approach provides exceptionally high data availability without compromising on accuracy and eliminates potential sources of error and uncertainty. Babcock’s FORECAST also allows maintenance to be safely and efficiently conducted on station offshore, ensuring there is minimal disruption to data availability and system operational uptime. In addition, ZephIR 300 requires no recalibration or maintenance within the warranted period which becomes essential in any remote deployments as seen in offshore applications such as these. Mr McConville added, “While this was a six month validation project, FORECAST has actually been offshore for 16 months in the Gwynt Y Mor wind farm. This included an initial development phase where the hull and mooring systems were tested and proven over a full calendar year. This is one of the longest continuous deployments of a floating LiDAR system. “FORECAST has demonstrated that it can withstand demanding offshore weather conditions all year round, measuring winds reaching 100km/h in waves over 8m high, and continue to provide consistently high data availability. The full report and results of the validation campaign will be published by the Carbon Trust later this year. © 2015 Zephir Ltd. All rights reserved. ZephIR, Zephir, ZephIR 300, ZephIR DM, ZephIR Direct, ZephIR Power, ZephIR Care and Waltz are trademarks of ZephIR Lidar. Other company and product names may be trademarks of their respective owners.